Our pets seem to have a way of getting into trouble. Whether your British shorthair is an amazing acrobat (except when she isn't) or your labrador thinks dirty socks are a delectable delicacy, accidents and injuries can happen when you least expect them. This makes them quite difficult to plan for financially. And it isn't just accidents that can strike unexpectedly. Illnesses such as gastroenteritis, bladder stones, diabetes, and kidney disease can all be an unwelcome, and costly, surprise. Pet health insurance provides peace of mind knowing you won't face future vet bills alone. Find the plan that's right for your family. Some plans cover just accident and illness and offer a lower monthly payment. Other plans provide more extensive coverage, even reimbursing you for regular veterinary care such as vaccines and neutering. It's important that you understand your plan and what it covers thoroughly. Whichever plan you choose, we recommend locking in insurance while your pet is in good health, as pre-existing conditions won't be covered. 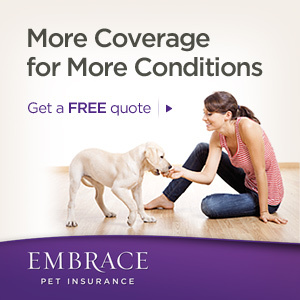 Nordhoff Veterinary Hospital proudly recommends Embrace Pet Insurance. All insurance plans have some exclusions and we wanted to include some information about that as well. 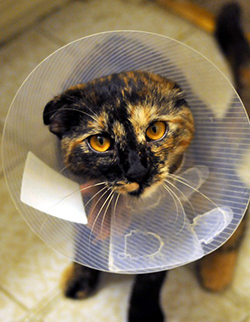 Below is a list of common pet insurance exclusions. Be sure to check with any plan you are considering to see which of the following they will or will not cover. This is the most frequent insurance exclusion. Any illness or injury that begins before your pet is covered by insurance is considered pre-existing. Be warned, even if your pet had no signs or symptoms and wasn't diagnosed, some conditions will still be considered pre-existing by insurance companies. Also a very common exclusion, congenital conditions are problems that your pet is born with. Sometimes even if these conditions are not noticeable immediately, they are still considered pre-existing. Luxating patella and umbilical hernia are two of the most common congenital conditions seen in veterinary practices. Sometimes there are conditions, such as hip dysplasia, that your pet may be genetically predisposed to. Some plans provide limited coverage for hereditary conditions. If your pet is of a breed known to be predisposed to certain health conditions, whether hereditary conditions will be covered is a very important question for you to ask plan providers. Conditions that could've been prevented are often not covered. For example, if your pet has not regularly been vaccinated with the DHPP vaccine and then develops distemper, the treatment of this illness will likely not be covered. Most insurance plans will also not cover health problems due to obesity. Procedures such as tail docking and ear cropping, pedicures and declawing, dewclaw removal, and any other procedure not deemed medically necessary will often not be covered. When researching pet insurance plans, be sure to check if preventative care such as vaccines, parasite preventatives, spays and neuters, and dentistries are covered. This ranges widely from plan to plan. As pregnancy is considered a preventable condition, your pet's reproduction expenses will more than likely not be covered. As more and more veterinarians are using prescription diets and supplements in their practices, more and more companies are beginning to cover these costs. Be aware though, many plans still do not. Be sure to check with your plan provider to see if special diets, vitamins, and supplements are covered. Many plans are now offering at least partial coverage for chiropractic therapy and acupuncture but most other holistic therapies will not be covered.